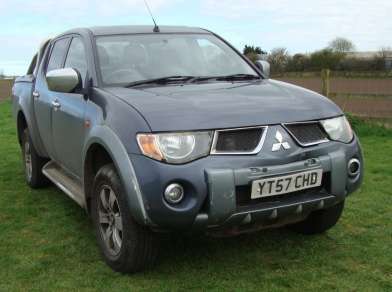 SEPTEMBER 2007 57 MITSUBISHI L200 2.5 Did AUTOMATIC DIAMOND DOUBLECAB PICKUP, GREY, 140,150 Miles, Black leather, Sat Nav, Sunroof, Parrot, Heated & Electric Front seats, Radio/Cd, Electric Windows, Electric Mirrors, TWIN AIR BAGS, Chrome Rear Roll Bar, Front fogs, Running Boards, Alloys 245/65R17 Bridgestone Dueler Tyres, Colour coded rear lid and Towbar. MOT January 4th 2018. Please note Damage on Front and rear side, Hence price.